The Mandola (the big brother of the Mandolin), has 8 strings in 4 pairs, tuned in 5ths. The Mandola retains the high-tension stringing but allows lower parts to be played. The Tenor Mandola (or Mandola) is tuned as a Viola, CGDA, one fifth below a mandolin. Octave Mandolas (also known as Octave Mandolins in America) are popular because of their suitability for Acoustic and Celtic music, being tuned GDAE, an octave below a Mandolin. 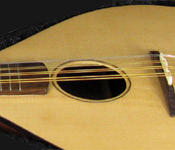 Because the Octave Mandola neck is shorter than a Bouzouki it is easier to finger, but the strings are heavier.